So thankful for everyone's help cob-operation and the fine job the Riverside staff did helping USCS with this event. And a really and to Billy for a great track prep job! 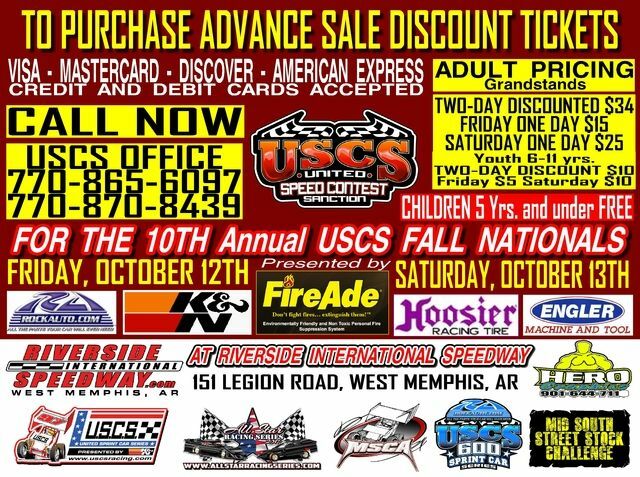 Atlanta, GA – October 10, 2018 – At least $8.000 is up for grabs when the United Sprint Car Series presented by K&N Filters invades the historic Riverside International Speedway in West Memphis, Arkansas on Friday and Saturday, October 12th and 13th for the 10th annual USCS “Flip Flop 50” Sprint Car Shootout when FireAde presents the $60,000 USCS Fall Nationals 2018. The two-day racing event serves as the 2018 season finale for Riverside International Speedway. The unique fan favorite “Flip Flop 50” racing event has actually been renamed the “Flip Flop 54” for this season’s event as a tribute to Memphis native and sprint car driving great, 49-year-old Greg Hodnett who lost his life on September 20th in a sprint car racing accident in Pennsylvania. The format for the “USCS Flip Flop 54” is a United Sprint Car Series original that is sometimes imitated, but, never duplicated. The unique format usually features twin 25-lap main events with the first starting straight-up and the second starting fully inverted from the finish of the first. This year’s event will feature twin 27-lap main events in honor of Greg Hodnett whose car number in recent times was the number 27. Each of the 27-lap sprint car main events will pay the winner $2700 to win. The first USCS Sprint Car main event will be started straight up from the positions that drivers earned in the qualifying heats and the K&N Filters Pole Scramble on Friday night. The winner of the first 27-lap main event will be inverted to the final starting position in the second 27-lap A-Main event, that will start fully inverted from the finish of the first main event. Should the winner of the first main event win the second main event from last position they will receive a $2700 Bonus for the accomplishment. The USCS presented by K&N Filters winged sprint car racing format on Friday night at 7:30 pm features a racing program that includes the Hoosier Tire Speed Dash for the top six cars from the previous main event followed by the sprint car qualifying heat races for Saturday night’s first USCS Flip Flop 54 main event. The top eight qualified drivers via passing points then compete in the K&N Filters Pole Scramble sprint car event. The K&N Filters Pole Scramble finishing order will determine the line-up for the front four rows of the first of Saturday’s USCS “Flip Flop 54” 27-lap main events. On Saturday evening at 6:00 pm the USCS winged sprint cars will contest a series of B-Main/Last Chance races that determine the final line-ups for the first of the two 27-lap main events. The first main event will start the field straight-up from their final qualifying order and pays $2700 to win. The second 27-lap main event will start with the field inverted from the finish of the first main event. The winner of the first race will start last position. That race will also pay $2700 to win. A bonus of $2700 will be paid to any driver who can win both races after winning the first sprint car main event and starting last in the second event. Joining the USCS Outlaw Thunder Tour winged sprint cars for the $60,000+ USCS Fall Nationals will be the two other winged sprint car divisions. Those are the M.S.C.A. 305 Winged Sprint Cars who will be racing for $1527 to win their 27-lap main event on Saturday night after running the same qualifying format as the UUSCS Outlaw Thunder Tour winged sprint cars on Friday night. The schedule also includes the www.RockAuto.com USCS 600 Sprint Car Series for winged 600 mini sprints who have a shot at nearly $2000 in top prize money over the two nights. The www.RockAuto.com USCS 600 Mini Sprints will contest a complete racing card on both nights including the Hoosier Speed Dash, Qualifying Heats and Main Event(s) each night. Additionally, the All-Star Late Models compete in their qualifying events on Friday night including their qualifying heat races and K&N Filters Pole Scramble semi-main event. The All-Star Late Model Series drivers will compete for $2027 in their 27-lap final on Saturday evening. A top prize of $1127 in cash plus merchandise is posted for the Mid-South Street Stock Challenge division that also runs its qualifying heats race on Friday night plus their own K&N Filters Pole Scramble. Their B/Main last chance race(s) and 27-lap final will be on Saturday evening as well. Fans can expect two nights of wide-open racing to complete the USCS series’ two 2018 visits to the historic speedway during their 69th anniversary season finale. Friday Grandstand Admission pricing is $15 for Adult, Youth from 6-11 yrs. old are $5 and Children 5 yrs. And Under are Free. Saturday Grandstand Admission pricing is $25 for Adult, Youth from 6-11 yrs. old are $10 and Children 5 yrs. And Under are Free. ***Two-day discount Adult and Youth Grandstand Admission tickets are available. The pricing for two-day (gets you in Friday and Saturday) is $34 for Adults and $10 for Youth 6 to 11 yrs. old. Children 5 yrs. and Under are FREE BOTH NIGHTS. **The two-day (and advance one day) admission tickets are available by calling the USCS office at either 770-870-8439 or 770-865-6097 with a major credit or debit card. 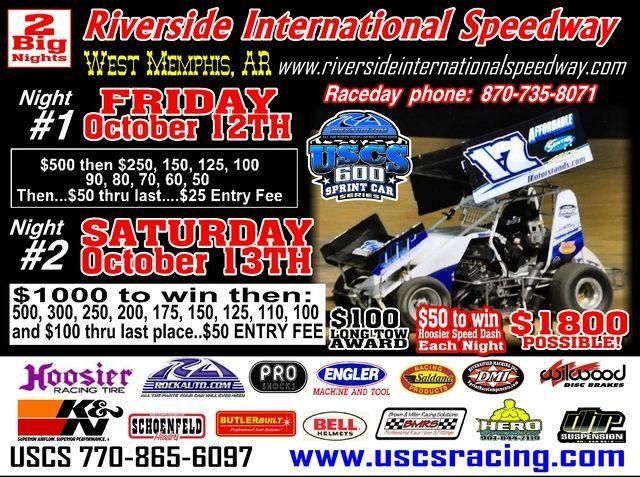 For all updated event info and USCS rules please visit www.uscsracing.com or call 770-865-6097. USCS Media contact: Pete Walton peteuscs@att.net or by phone at 770-865-6097. FRIDAY AND SATURDAY, OCTOBER 12th and 13TH - 2018. **In Tribute to Memphis native and sprint car racing great Greg Hodnett, the 2018 Flip Flop 50 will actually be the Flip Flop 54 featuring twin 27 lap main events paying $2700 each to win with a $2700 BONUS to any driver who can win the second 27-lap fully inverted A-MAin from the rear of the field. Plus $1000 Hard Charger Award. Them boys want no part of you. Looks as if you may be just spectating if you show up. 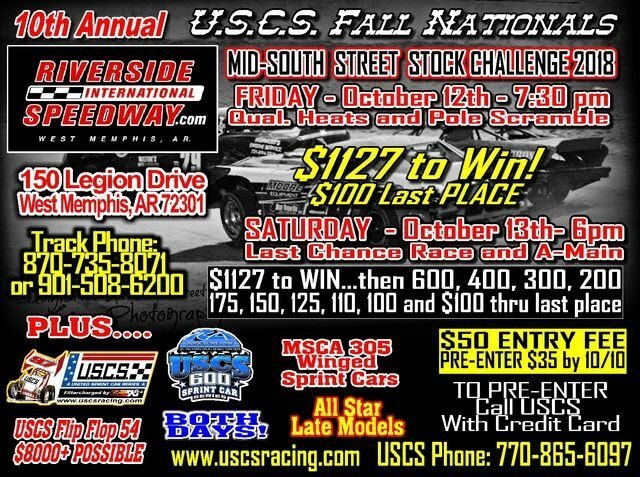 The All Star Late Model Series Championship Race has been added to the USCS Fall Nationals event featuring some of the best Mid-South area Late Model drivers coming to the historic track for their season finale. Detials will be announced this weekend. Their rules are an exact match with te Riverside rules. 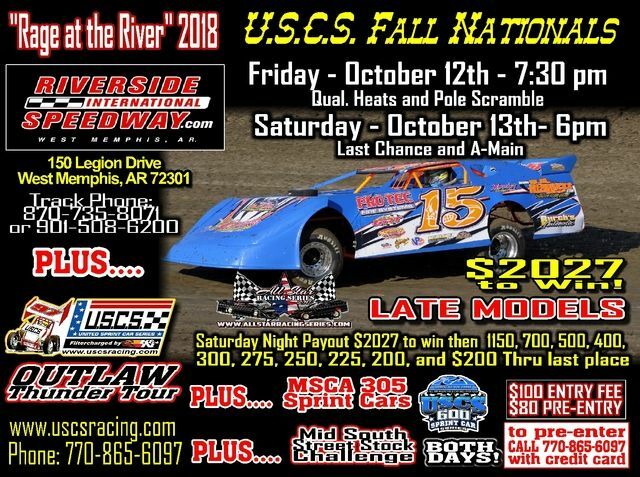 The All Star Late Model Series Championship Race has been added to the USCS Fall Nationals event featuring some of the best Mid-South area Late Model drivers coming to the historic track for their season finale. Deatials will be announced this weekend. Looks as if Poppy get's to feast on them touring boys again. Back to top....three weeks away! Any bonus if a driver wins all three sprint class features either night? Two USCS Sprint classes, but you also have the MSCA cars. Wonder if anyone will try to run all three each night. Just few years ago Tim Crawley ran every class running that night. That was one very exciting night of racing!!!!!!!!!!! We'll see what happens on this night. Whatever happens, midge, I doubt seriously that you'll be there to see it. What a shame. I have two nights planned for the next month. This Tuesday at Landers Center and either Friday or Saturday at the Flip Flop.